Mr Steve Morris has done it again! Jumble Tales is another wonderful collection of short stories. The ‘real’ people are back with their ‘real’ lives and their ‘real’ endings. A jumble of tales put together to once again show us life doesn’t always smell of roses, some days it can smell a little on the nose. Following on from Steve’s previous collection In All Probability, Jumble Tales brings to life real characters from the past, present and future. Some stories are wacky, some intriguing and some are downright scary. There is something for everyone and I dare say there will be at least one story which resonates for each and every reader. Fate and destiny are again big players and of course the biggest player of all is Lady Luck. I honestly cannot pick a favourite story, I loved them all and for different reasons. I loved the characters in some and I loved the circumstances in others, quite a few I loved both the characters and the circumstances. There were a couple of stories where characters from In All Probability made an appearance and I loved that Steve did this, it felt like I was being given another chapter to add to their previous story. Once again I wanted to read beyond the last word of each short story, wanted to know more of what was going to happen and this is testament to Steve’s writing ability. I feel like I am reiterating a lot of what I said in my review for In All Probability but the fact is this book does follow the same lines and is just as good, if not better. Again it was great to read a story here and there and I had to stop myself from reading the whole book through; I didn’t want the stories to mesh together but then I also didn’t want to put it down. A round of applause I must give for I was captured by the words and it was very hard to practice restraint and make myself stop. And whilst I am clapping I must also applaud another fantastic cover! 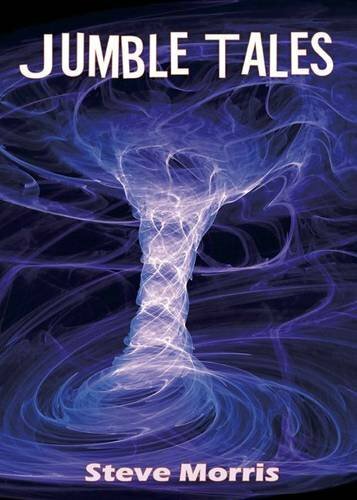 If you have read In All Probability and liked it I definitely recommend following through and obtaining Jumble Tales, you will not be disappointed. If you haven’t yet read In All Probability and you like the sound of ‘real’ stories without fantastical endings but with probable endings then I suggest you go out and purchase both In All Probability and Jumble Tales. Why not treat yourself to both?! I dare say you will be happy with your purchase. Thank you again, Steve, for providing me with a copy of your work. I love reading your short stories and if you ever get around to writing a novel be sure to let me know, it will definitely make its way into my house sooner rather than later! Thanks, Steve!! Another super review and it’s in the company of some great book discoveries on Mandythebookworm’s blog. See you next Wordy Wednesday. Absolutely my pleasure, Steve. Thank you for sending me your book and letting me enjoy another fantastic read.